This week, I am quoting an author whose book I do not yet own: Anna Pavord, author of “Tulip” and “Bulb.” I need to own the latter. In middle age, I have realized that I have a few consistent passions toward specific kinds of plants. One of them is the family of bulbs and corms. I think what I love is the gift-like nature of bulbs: they are like little papery packages, hiding wonderful flowers within. I love the surprise aspect of not knowing exactly when their shoots will suddenly appear; and many of my favorite flowers come from bulbs: narcissus, crocus, amaryllis, lilies, etc. Bulbs work on their own timetables. Writing 101: Where Do I Write? Today’s assignment: describe where I write. I like to write in any of the rooms that look out over my garden. That could be the sunroom, on the main level of our house, or the master bedroom upstairs, or a small study off the bedroom. All have walls that are almost entirely windowed, to let in as much light as possible. 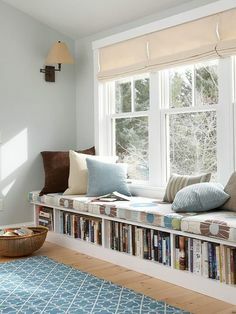 The master bedroom and study also each have a built-in window seat that runs almost the whole length of that wall, and under them are built-in bookshelves where I keep many of my hundreds of gardening books (some of which I quote in my “Saturday Snippets” on this blog). Our house is built on a slope, so the sunroom actually sits a full story above the garden, which gives a wonderful view over the flowerbeds and shrubs, and creates the impression of being in a treehouse among the other trees. The bedroom and study are yet another story higher. Our lot is not large, but it is deep and the plantings are mature, so the tall trees around the perimeter make it seem larger than it is and conceal surrounding homes from view. Right now the foliage is changing color and I am looking out at a tapestry of green, red, orange, yellow and brown. It looks much as it did when we brought our first baby home from the hospital in early November, when I spent days with her in my arms, nursing her and looking out at the changing leaves. This is the time of year when we look forward to holidays and start to plan their celebration — a specially joyous activity once we had children. Perhaps because of this, as well as all the planting I normally do in autumn — especially spring bulbs — I associate fall with hopeful new beginnings instead of decline. Of those rooms, my favorite in which to write is the sunroom, as it is uncluttered and I don’t get distracted by looking around and thinking of the household chores I should be doing instead of writing. It is also close to the rooms where my children do their homework, so we can be companionable in our separate pursuits. Photo: Pinterest. Not my own windowseat, but very similar!